Few people think of November without thinking of Thanksgiving, and the people of Northwest Louisiana, with much for which to be thankful, are no different. This day of thanks was celebrated inconsistently for many years until 1941, when Congress finally sanctioned the fourth Thursday in November as the legal holiday. Unlike many holidays, when you traditionally venture out to celebrate, Thanksgiving is the most commonly celebrated at home, in the company of friends and family. Chances are you will celebrate in this way as well. For a more elegant celebration this month, the Shreveport Country Club plays host each November to the Shreveport Demoiselle Club’s annual gala. The Debutante Ball is a grand finale for college debutantes to make their formal bows to society after a season of parties beginning in June. After the debutantes gracefully promenade around the ballroom on the arms of their chosen escorts, guests dine, dance, and mingle at the truly grand occasion. Whether you’re already home, coming home to visit, or just passing through, November is a special time of year to be in Northwest Louisiana for family, food, and relaxation. 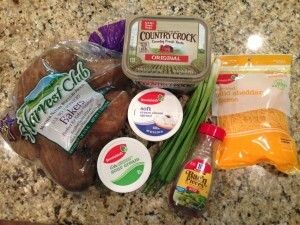 Baked Potato Casserole is a Mardi Gras to Mistletoe side dish with a new twist on an old favorite that is sure to be a hit among all age groups. Cook the potatoes with enough water to generously cover in a saucepan and bring to a boil. Boil until the potatoes are fork-tender and drain. Mash the potatoes, butter, salt and pepper in a bowl. Add the cream cheese and sour cream and mix well. 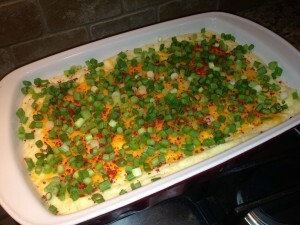 Spoon the potato mixture into a 9×13-inch baking pan and sprinkle with the Cheddar cheese. Bake at 350 degrees for 30 minutes or until brown and bubbly. Sprinkle with green onions and bacon bits. You may prepare the casserole in advance and store, covered, in the refrigerator. Bake just before serving. You can prepare Twice-Baked Potatoes by baking the potatoes, mixing the potato pulp with the remaining ingredients and stuffing the potato mixture into the potato shells. Bake as directed above. Cauliflower Au Gratin is another great Mardi Gras to Mistletoe side dish that your family is sure to enjoy this holiday season. Cook the cauliflower in boiling water in a saucepan for 6 minutes or until tender. 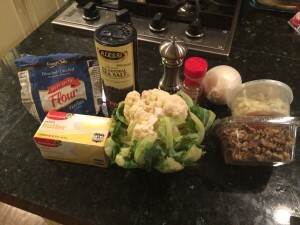 Drain and arrange the cauliflower in an 8×8-inch baking dish. Melt the butter in a saucepan and add the onion. Sauté until tender and remove from the heat. Stir in the cheese, celery salt, cayenne pepper, salt and black pepper. 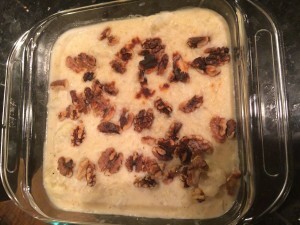 Pour the cheese sauce over the cauliflower and sprinkle with the walnuts. Broil until the walnuts are brown.